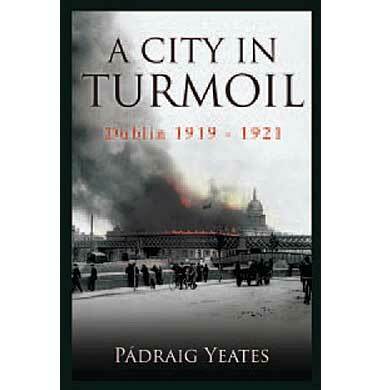 Padraig Yeates’ history of Dublin in the political turmoil of the early 20th century began with his book Lockout on the great strike of 1913, published in 1998. It continued with ‘A City in Wartime’ – an account of how Dublin was affected by both its involvement in the First World War and the Easter Rising that brought warfare to its own streets . His chronicle of the city now continues with ‘A City in Turmoil’, which deals with the years of nationalist revolution in 1919-21 as power slipped away from the British administration and into the hands of the republican separatists of Sinn Fein. What is remarkable in Padraig Yeates’ books is the attention to detail, which results in remarkably intimate portrayals of the Irish capital. This book does not cover the ‘glamourous’ side of revolution -the tales of daring shootouts and getaways – but rather the nuts and bolts of how the city operated. This book deals with the years of nationalist revolution in 1919-21 as power slipped away from the British administration and into the hands of the republican separatists of Sinn Fein. The military campaign of IRA guerrillas against British forces is covered but we see it rather as the Dubliner of the time would have, an occasional, terrifying interruption into daily life, which ,though strained by an all night curfew and the ubiquitous presence of troops and armed police, went on almost normally. Dublin Corporation, whose records form the spine of this book, was affected by the War of Independence – many of its members were arrested and at one point its meeting place in City Hall was was held up at gunpoint by Auxiliaries and several Sinn Feiners dragged away into adjacent Dublin Castle. However, the Corporation devoted equally as much time to the more pressing questions of how to finance the city, run after January 1920 by a Sinn Fein majority, once British funding had been cut off. Among the vital questions were how to maintain the city reservoir, what to do about the terrible slum problem and housing shortage and how to keep health and education services online. A coal strike in Britain in the winter of 1920 meant emergency supplies of fuel had to be bought in. An epidemic of sexually transmitted diseases in the city’s red light district – allegedly spread by soldiers returning from the World War – further concentrated their minds. Dublin Corporation remained preoccupied by practical challenges rather than national revolution throughout the period. What we find is that the revolutionaries were a lot more practical than one might assume. Though Sinn Fein and ‘Republican Labour’ held a majority on the Corporation, the Mayor was an independent nationalist, Laurence O’Neill and an important block was formed by the former constitutional nationalists and unionists, who formed the Municipal Reform Association. Symbolic disputes did arise, Yeates tells us, for instance over the right of councilors to answer roll call in Irish, but in general, the diverse parties worked together to try to keep city government functioning. British Local Government funding was tactically accepted where necessary, for instance to continue the funding of technical schools, a Republican bond scheme helped some more of the financing, while interestingly the former unionists in the Bank of Ireland provided loans to keep the separatist project on the rails. Instrumental in arranging this was William Cosgrave, who just a few short years later would be the first prime minister of the Free State. All of which begs the question, ‘how revolutionary was the revolution?’ One gets the impression that in Dublin at least in was a very carefully controlled phenomenon. A one day general strike against the arrest of republican activists in early 1920 brought the city to a standstill. Trade unions participated enthusiastically, as did IRA Volunteers who made sure that all businesses closed. But this was not allowed to develop into a concerted strike wave that might demand economic as well as political change. Similarly, while Michael Collins’ Squad of IRA assassins ruthlessly killed selected enemy agents and informants (including prominent unionist civilians such as Frank Brook) it was never allowed to degenerate into widespread shooting of informers or civilian political enemies that to some degree occurred in places like Cork. Nor did the revolutionaries ever aspire to a one party state or a monopoly of political power, as in analogous circumstances did movements like the Algerian FLN. Unionists in Dublin decided to wait out the violence and negotiate their place in whatever type of Irish self government transpired. Dublin unionists themselves, for the most part did not challenge Sinn Fein directly. Most of their representatives in the Municipal Reform Association effectively sat out the conflict and were equally as appalled by the behaviour of British forces such as the Auxiliaries as they were by the IRA’s actions. Unionist passivity in Dublin remains somewhat puzzling. The Republicans’ campaign was not intended to be sectarian, and never targeted the Protestant community as a whole (roughly a quarter of the city’s population) in Dublin. But there were certainly killings of prominent unionists who worked either for or with British forces that could have been taken as an attack on their community as Northern unionists took the killing of police officers from Ulster. Indeed the outbreak of violence in the north led to a forceful boycott of Belfast goods in Dublin in aid of northern Catholics. And though republicans of the era would have denied they were sectarian, they were certainly Catholic. Yeates shows that the mass rallies in support of prisoners on hunger strike were marked by collective saying of the rosary. Moreover there were combative unionists in Dublin. We know now that some formed a paramilitary force in the city at the time of Ulster Home Rule crisis in 1912-13. And yet Yeates shows that in the War of Independence their representatives decided essentially to wait out the violence and negotiate their place in whatever type of Irish self government transpired. The truce in July 1921 is where the book ends, providing relief from the constant tension of the secret war for insurgents, citizens and the British alike but also providing breathing space for the city’s hard-pressed and under-financed public representatives. A City in turmoil is not a military history of insurgency and counter-insurgency in Dublin. The principle events such as Bloody Sunday and the burning of Custom House are dealt with in all their bloody detail but they are not the main focus, which is a political and social history of Dublin in these years. The military story has to some degree been covered by William Sheehan’s Fighting for Dublin, which publishes the British Army’s reports on affairs in the Irish capital. A good account of the IRA’s perspective can be found in the chapters on Dublin in Joost Augusteijn’s, ‘From Public Defiance to Guerrilla Warfare’. The totality of this story, in which over 300 people died, several hundred more were injured and some 3,000 imprisoned in the city, remains to be fully told. But perhaps too much attention has already been placed in 20th century Irish history on the relatively limited (compared to apocalyptic events elsewhere in Europe) political violence that led to Irish independence. For those who want to know the wider social context of these years in Dublin, Yeates’ latest book will be a revelatory and and fascinating read. Written by: John_Dorney on 28 October, 2012.on 29 October, 2012.